Read more about Exabytes News to stay on top of the latest happenings in the company. Get your direct resources here to help you stay connected with us!In Exabytes News, it is the hub for the official announcement from our company. Our news range from introducing new products or services to operation-related matter. Moreover, we also update our audience here on the new partnerships to important feature updates. We leverage our news to cater to all our customers who have signed up with us. Therefore, we convey only the most accurate information as of the date of release.For more information on the Exabytes’ latest news and happening, stay tuned to Exabytes News! Feel free to visit our website here. Alternatively, you can follow us on Facebook for up to date news!This category of our blog contains archival information. Hence, archived information contained or referenced herein should not be considered current and may no longer be accurate. 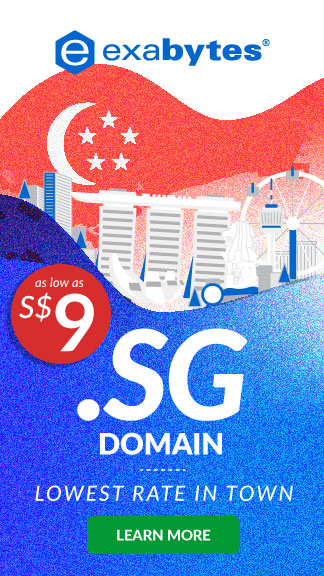 I LOVE SG Domain. Now for Only SGD4.90!